OPNsense supports native IPv6 as well as tunneled IPv6. 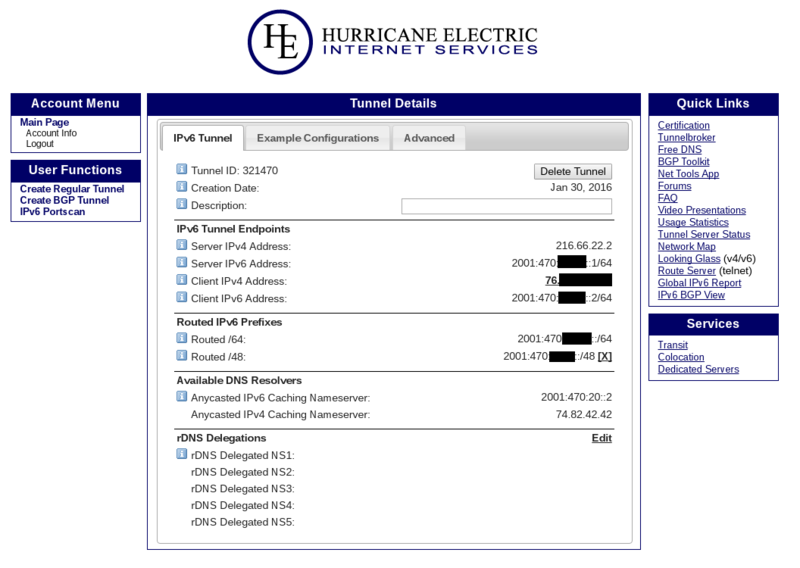 This article shows how to set up TunnelBroker, Hurricane Electric’s IPv6-in-IPv4 tunnel, with OPNsense. If you’re based in the US and you use Netflix, you might not want to follow these instructions. Netflix now blocks TunnelBroker. If you use IRC or need access to SMTP over the TunnelBroker connection, Hurricane Electric requires you to go through their free IPv6 certification process. Their “sage” level is the highest level and will allow you to enable IRC and SMTP. Note that your OPNsense firewall must be directly connected to the Internet. Being behind a NAT will not work. The rest of this article assumes you already have a TunnelBroker account. If not, sign up and go through the free IPv6 certification process. Screenshots are provided throughout this article. 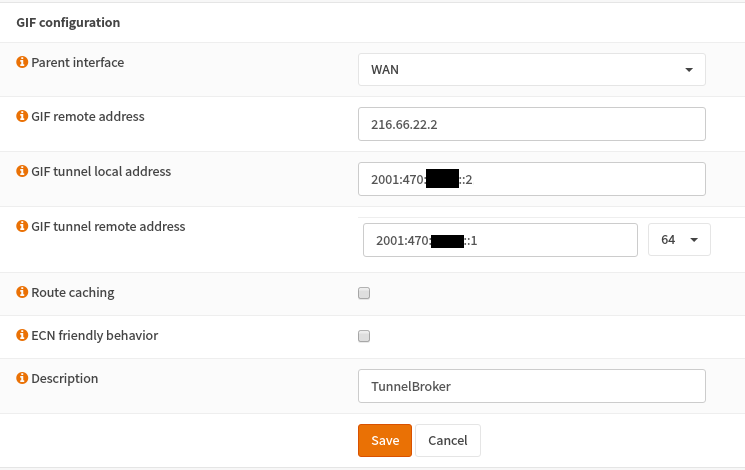 Enable ICMP on the WAN side of your OPNsense firewall. TunnelBroker’s UI will tell you an IP to use when you’re setting up your tunnel on their end. To configure OPNsense start with adding a new gif interface. Go to Interfaces ‣ Other Types ‣ GIF and click on Add in the upper tight corner of the form. Use the following settings and copy in the IPv4&6 addresses from your TunnelBroker’s UI. The newly created GIF tunnel must now be assigned as a new interface. Go to Interfaces ‣ Assignments, select the GIF tunnel for New interface and click the + sign next to it. Then under Interfaces -> [OPTX] check Enable Interface and change the description to e.g. TUNNELBROKER before hitting Save. The newly created interface must now be set as the default IPv6 gateway under System ‣ Gateways ‣ Single by editing the new gateway entry TUNNELBROKER_TUNNELV6 and checking Default Gateway before saving. Now add basic firewall rules. Since I have a LAN network and a WLAN network, I allow WLAN to initiate connections to LAN, but not the other way around. I only have servers on LAN whereas most of my clients are on WLAN (Wireless LAN). I block all incoming to LAN and WLAN. Of course, outbound connections are fine. Now configure your LAN interface. The static IPv6 address we’ll give it is a /64 address from your assigned /48. I won’t show the WLAN settings simply because it’s the very same. You’ll repeat the same process for further networks, but assigning the next interface a separate /64 address. We’ll next configure OPNsense for Stateless Address Auto Configuration (SLAAC). We’re going to set up the DHCPv6 service. Go to Services ‣ DHCPv6 ‣ Server. Simply choose a range for clients to use. Save your settings. Next go to the Router Advertisements sub tab on that same page. Set the Router Advertisements setting to Assisted and the Router Priority setting to Normal.